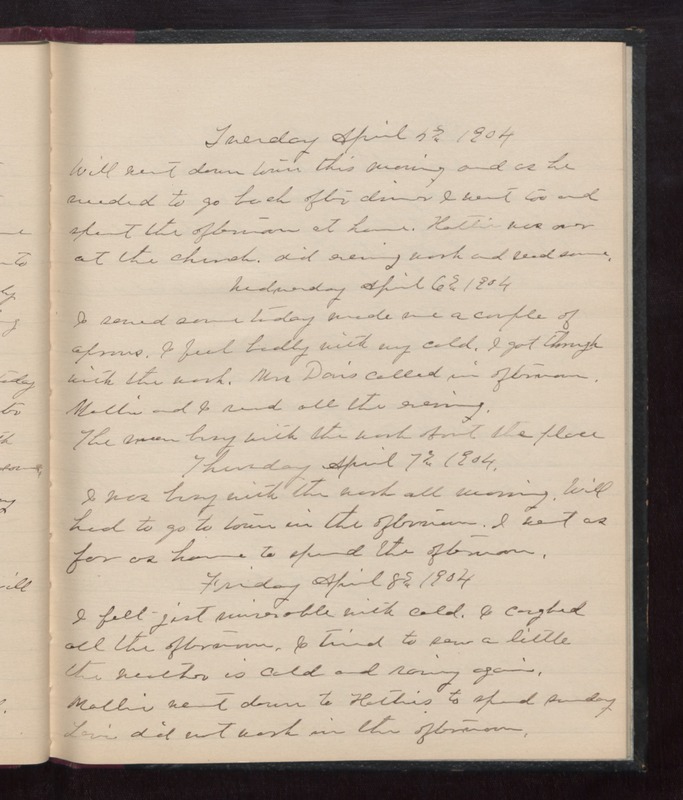 Tuesday April 5th 1904 Will went down town this morning and as he needed to go back after dinner I went too and spent the afternoon at home. Hattie was over at the church. did evening work and read some. Wednesday April 6th 1904 I sewed some today made me a couple of aprons. I feel badly with my cold. I got through with the work. Mrs Davis called in afternoon. Mollie and I read all the evening. The men busy with the work about the place. Thursday April 7th 1904 I was busy with the work all morning. Will had to go to town in the afternoon. I went as far as home to spend the afternoon. Friday April 8th 1904 I felt just miserable with cold. I coughed all the afternoon. I tried to sew a little the weather is cold and rainy again. Mollie went down to Hatties to spend sunday. Levi did not work in the afternoon.